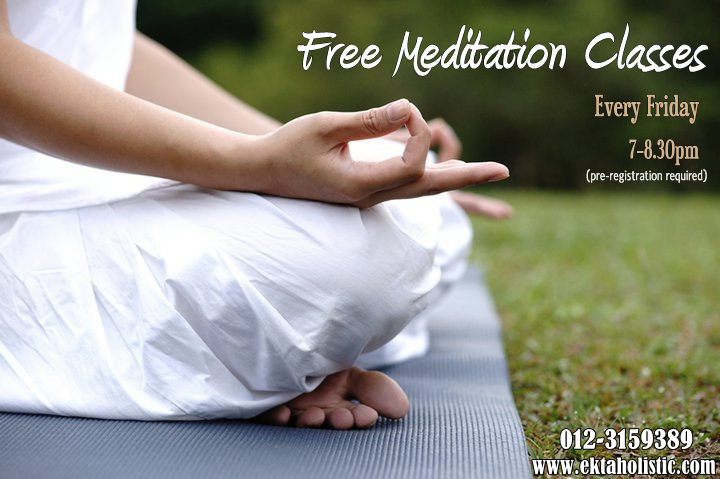 Learn how to meditate and experience the real meditation with Ekta Holistic Centre today! Every Friday from 7pm-8.30pm, our centre offers a complimentary 90-minutes group meditation session. The meditation session will be guided by Master Surjit Singh Khalsa. This free meditation session is suitable for beginners or anyone wanting to try meditation for the first time. It is also great for regular meditators who are already practicing meditation, who wishes to explore more wonderful meditation techniques. Each session begins with a brief introduction to guide you into the quiet and tranquil state of your meditation. The meditation session include basic instructions, guided meditation, and follow by Q&A session (an opportunity for you to get answers to all of your meditation questions). You will also be learning about relaxation and breathing techniques. During the session, you will also learn how to improve and enhance your life, your relationships with others, and improving your mental and emotional well-being by applying meditation in our daily lives. Most importantly, you will learn how to integrate the benefits of meditation in your everyday life! Discover the Wonderful Benefits of Meditation Today! Meditation is something to be experienced, personally. It is a unique, absolutely wonderful feeling. With regular practice, you will start to feel and notice the positive differences and increased vitality in every aspects of your daily life. Click on the links to learn more about meditation, or the benefits of meditation. Limited Seats Only. Pre-registration for the class is required. To register/for more information, please call 012-3159389. Alternatively, you can send your online enquiry by clicking here. We will reply to your queries as soon as we can. *Something about meditation: Words alone are simply inadequate to describe it. You must come and experience and feel it for yourself…..